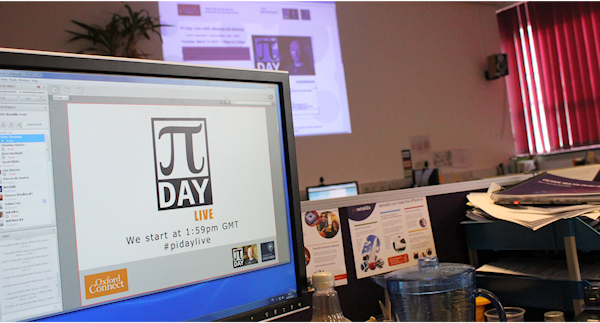 So, Pi Day Live is over, seemingly almost before it started. It was 45 mins of high pressure activity that we’re all still talking about and buzzing from. It was an event that was innovative in design, challenging to deliver, but that we are proud of helping to make a success. So much so that we’ve made a special “Netskills uncut” story about our part in the day that you can watch below. As you can probably tell from the film, we had fun being involved in Pi Day Live, but we also took our role very seriously. Here are a few reflections on the work we did behind the scenes. When we saw the designs for Pi Day Live, we knew it was going to be a challenge for everyone involved. The event would last only 45 minutes, but in that time we needed to support a live presentation, get everyone into the right breakout rooms (for the practical experiments) and back again to review the results in the main room. The tight time scale didn’t leave any room for errors, so we made sure we planned each and every one of those 45 minutes. We also had a backup plan for each action. And another. To make sure we could deliver that plan, we also made sure we had appropriate resource. By which, I mean people. We are lucky to have a team here who are very experienced at running and managing events, both online and offline. We called upon all that expertise to help us plan, test and deliver the event just as we’d agreed with Oxford. Given the number of people involved here, we decided to turn our office into “Collaborate mission control.” We got an atmosphere to match. At times it was nervous, tense, fun and exciting (feelings not that common in the course of a normal day in the office). It was a great team experience and my personal thanks goes to all those who helped out. By the end of the event, participants had derived a crowd-sourced value for pi of 3.1098020381 from 297 submissions. Not a bad approximation and an impressive result from a challenging set of activities. If you’re inspired to try them for yourself, both the recording of the live event and instructions for the tasks are available, so you can relive it whenever you choose. We think Oxford have come up with an innovative format for online public events that will be relevant well beyond Pi Day. I’m sure they’re already thinking of other topics for future events and I hope we’ll be able to help with those too. If you’re inspired to try your own event like this and want some help to make it happen, please do get in touch.